More so than anything else, the Eucharist is what anchors many peoples' life, prayer, and ultimately the way they live their lives. In this deeply personal book, Father Ronald Rolheiser delves into the history and meaning of this sacred tradition, drawing upon the insights of various scripture scholars, theologians, and church teachings. With personal warmth and great insight, he reflects on his own particular Roman Catholic upbringing and the centrality that the Eucharist has within that tradition. At the same time, he looks at other denominations’ traditions around the Eucharist. Our One Great Act of Fidelity is an investigation into the ways people secure their faith and belief and discover true intimacy with God and each other. 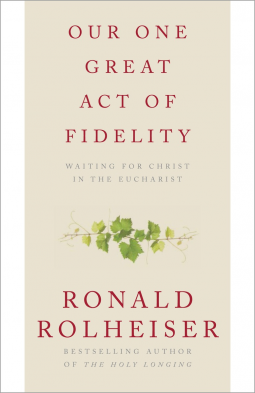 Ultimately, however, it is a spiritual and a personal statement of how Ronald Rolheiser understands the Eucharist and why he celebrates it every day. Ronald Rolheiser is a specialist in the field of spirituality and is currently President of the Oblate School of Theology in San Antonio, Texas. Father Rolheiser is the author of The Holy Longing, The Restless Heart, Forgotten Among the Lilies, The Shattered Lantern, and Against an Infinite Horizon. He writes a weekly column that appears in more than 90 Catholic publications. More information on his work can be found at RonRolheiser.com.